Adult jersey’s fit snug, if you prefer a looser fit, go up one to two sizes. Youth sizes also fit on the small side, consider going up a size. You also have the option of purchasing a jersey at the time of your registration. They are $100 to buy and you will receive a $25 charitable tax receipt for every jersey you purchase. 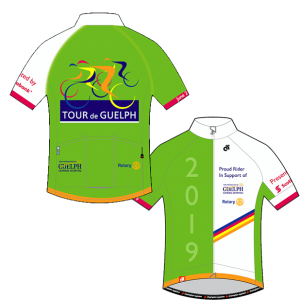 All proceeds from jersey sales will be donated to the Foundation and Rotary clubs through Tour de Guelph. All those to meet the $300 fundraising milestone or to purchase a jersey with their registration by Thursday May 9th, 2019 will receive their jersey on the day of the event. All others will be delivered 4 to 6 weeks following the event.